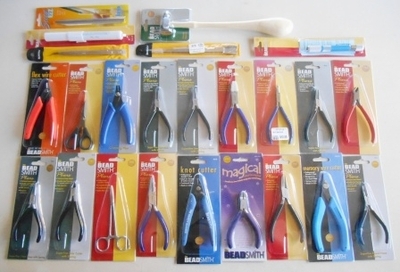 Side cutters, pliers, knotters, crimpers etc. These double nylon flat pliers are perfect when working with soft metals and for straightening wire. This style features two flat jaws which are used for gripping and holding wire and creating wider and broader angular bends, as well as flattening and straightening metal. They are also useful for opening and closing jump rings. Used for wire work and jewelry making. Gives stability. These super-fine round nose pliers are best for jewelry making and wire work. Bent Chain Nose Pliers are great for stability in jewelry making and getting into difficult places. This crimper is used to form smooth unobtrusive crimps. Made from high-grade tool steel, this 5" cutter is ideal for cutting flex wire, in addition to thread, cotton cord, leather thong and soft wire with virtually no pinch. It is *not* intended for cutting memory wire or other hard materials which could result in scarring of the cutting edges. Features patented shear blade by-pass and minimal outside bevel. Creates a flush cut which requires less finishing. Spring action returns the tool to its open position after cutting. The ergonomic handle grips provide both comfort and the secure grasp required for precise control. This cutter is ideal for cutting thread, cotton cord, leather thong and soft wire. Super-fine side cutter with spring and boxjoint construction. This unique patented tool was created exclusively for use with 2mm crimps. Just a few easy steps will form a 2mm crimp into a more appealing round bead! Boxjoint flush cutter for wire. This cutter is designed for cutting memory wire and other hardened craft wire making it ideal for beaders and crafters who need to cut a variety of materials. The TZ1200 Thread Zapper is meant to be used for sealing off the ends of thread that frays. This scoop is the perfect tool for scooping and guiding small beads into storage containers. These tweezers have a very fine, bent tip for precision work. These tweezers have a scoop on the end and textured points for a better grip. Set of 12 different files 2mm x 100mm. Set of 12 different files 3mm x 140mm. The Bead Smith, 4 piece plier set includes: Chain Nose Pliers with Cutter, Round Nose Plier, Flat Nose Plier, Side Cutter and Carrying Case.